Is your laundry out of date or are you renovating the house? A well designed laundry not only looks great but can save you time doing the washing – and be safe. Here’s some great laundry design ideas to improve your laundry not only for function but also style. What Appliances Will You Be Using? Start off with the appliances you’ll be using first. A well-designed laundry works around the most important parts – the washer and dryer. Will you be too short to reach that last sock? 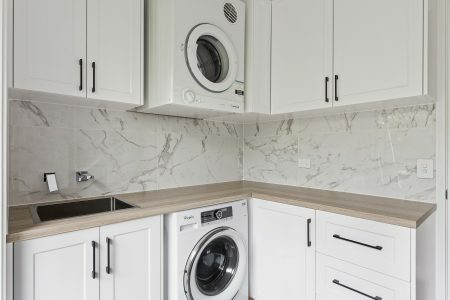 Once you’ve chosen the right washer and dryer for your household, you can then work on some design ideas. Folding areas or bench tables are great for folding clothes. It’s always difficult to fold large bedsheets. Having a table space in the laundry room is a smart way to avoid loads of washing ending up on your spare bed for days. Even if you don’t manage to finish folding in one day, you can add extra storage space. This could be a clothing rack to keep wrinkles out of work clothes. A folding area would also give you the perfect area to iron clothes worry-free. Benches and tables are at most times higher up. This ensures the kids are always safe when playing. You won’t have to worry about them running around the house and tripping on the wire of a hot iron. Do You Need Storage Containers? Storage containers are an excellent addition to a laundry design. Little cubbies give extra space for detergents keeping them hidden from small children. Also, it helps to style the room. There are several options for storage like fabric bins, plastic, or even faux leather. Think about the spacing in your room when choosing your design. This will help you plan on adding in decor or accent pieces for the leftover room. If storage bins don’t spark your appeal, install cabinets. Need more ideas than a simple laundry design? You can delve into the details of our design process for a guide to building your perfect laundry. Your home should be up-to-par with your expectations and visual ideas. We’re here to help turn your dream rooms into tangible spaces! Call Just Wardrobes today on (07) 5502 2444. Just Wardrobes offers an extensive range of both basic and high end systems to meet any budget.